After two weeks of the two biggest named strikers stealing the show, in gameweek 3 it was the turn of the premium midfielders. Alexis Sanchez was the FPL player of the week with 2 assists to go with his goal, now off the mark after no attacking returns in the first two gameweeks. While he may lose the Arsenal striker spot to Giroud or new signing Lucas Perez in the coming gameweeks, he remains a valuable acquisition in FPL for his goals record alone (16 in 2014/15, 13 in 2015/16). Eden Hazard provided 11 points and has now scored as many goals in the first 3 gameweeks as he did in his first 34 last season as he looks to have returned to his best under Conte. His stats before last season were consistently impressive. A combined 28 goals in the two previous seasons are more than any midfielder and he also assisted regularly, with 10 in each season, and 17 the season before. At 10.1 he is 0.8 cheaper than Sanchez and 0.4 cheaper than Man City's De Bruyne, and at the moment looks essential. 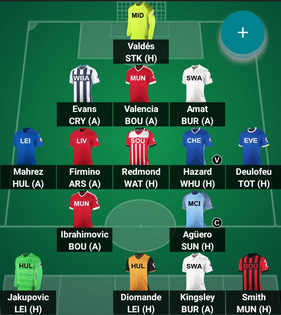 Fitting Sanchez, Hazard, Ibrahimovic and Aguero into one team will be the aim for many wildcarders, but a tough task. Not that it is difficult to forget Mesut Ozil as a premium mid after the fruitful season he had for Arsenal, but his goal at Watford was a reminder of the fantasy asset he can be. His runs from midfield are a joy to watch and the way he scored with his head was perhaps a surprise, as he is not known for his goal scoring or his heading ability. He will be looking to improve his scoring record this season and not just provide assists for teammates. Mahrez to Ozil will be a popular transfer over the two week break as the Leicester winger missed a penalty and blanked at home to Swansea. Refs Have Gone Penalty Mad! The early initiative from referees to adopt a zero-tolerance attitude towards pushing and pulling in the area has raised a few eyebrows. It is a hot topic in the media after soft penalties were given last week, particularly in the Stoke v Man City game. Refs are continuing to give much more penalties than in previous seasons. Another 6 were awarded this gameweek, but 3 were missed, so it might be worth signing penalty takers with a good record of scoring from the spot. Man City have started the season in fine form as the league's highest goal scoring team so far. Despite De Bruyne scoring the most goals and creating the most assists, the player who has surprisingly benefited most of the City midfield has been Raheem Sterling. Sterling has been involved in 5 of City's 9 goals so far. This has caused De Bruyne's ownership to fall from around 12% at the start of the season to just 5.5%, while Sterling's has risen to the same amount. Nolito has 3 goals and Silva and De Bruyne have 2 assists each, so the early signs are that the points will be shared around the City midfield, but De Bruyne could be a wise differential option in a wildcard team. The Belgian's stats were very good between his 2 month injury lay off, with 7 goals and 9 assists in just 25 games. Scoring is not the issue for Man City as long as Aguero is fit, it is the defence that looks weak and seems to be leaking goals despite being in control of all the games they have played so far. Pep's side have conceded a goal in all three games, meaning John Stones, owned by 34% of managers, has failed to keep a clean sheet. This is a cause for concern going into the Manchester Derby as City are yet to be tested, with an average of 62.2% possession. Fortunately for Stones owners, the goalkeeper situation is now resolved as Claudio Bravo is likely to start in goal after the international break. With gameweek 3 now over, we embark on a period without any Premier League football as a result of the first international break of the season. For FPL fanatics, like myself, an international break also brings up the prospect of having to decide quickly to wildcard early or not. In case you don’t know, the wildcard chip allows you to make unlimited transfers until the deadline of the next gameweek. The use of a wildcard may have positive implications on your rank and positions in mini-leagues but it also may have the reverse effect. Early Bandwagons: The use of an early wildcard allows FPL managers to get players who have a blistering start to the season. This doesn’t always guarantee higher overall gameweek points and a plush overall rank. However if you jump onto the correct bandwagons you will laugh all the way to the fantasy bank with quick fire returns. Increase in Team Value: The method is rather simple. It involves activating your wildcard as soon as the gameweek kicks off, transferring in the players that are bound to rise in price and ideally, transferring out the players in your team that are injured, out of form or those who will drop in price. Therefore, this allows you to build value during the international break, so long as you carry our the correct wildcard transfers at the right time. Taking advantage of price changes: As it is still the beginning of the season, there are less inactive teams than the end of the season. This means that the overall number of transfers of particular players will be far higher than from January onwards. This means you will see rapid price fluctuations in the market early on for in-demand players. The use of an early wildcard allows FPL managers to bring players who are due an increase, thus ensuring they are not maxed out of budget. Taking advantage of price changes is also linked to the last point as it enables managers to pragmatically increase team value. Injuries: Unexpected knocks and niggles can occur at any point in a season. By playing the wildcard so early you leave yourself exposed in the event of dealing with an injury crisis to your squad from now till December. Of course you can manage it by slowly waltzing along with your free transfer or by doing a mini-wildcard (two free transfers and a -4 hit). Yet the fixture congestion during November to December could be gruelling without a wildcard. Your rank could suffer as you may be forced to make multiple transfers in back-to-back gameweeks leading to mass point hits. Form: FPL managers cannot predict when a player will dip in form. It's unlikely that all early bird performers maintain their standards consistently for a full season. This must be considered when the initial thought of using the wildcard is made. You may be forced into taking hits suddenly and regularly if your early wildcard transfers backfire. To make matters worse, your opponents may have a better slice of luck and could outdo you if your wildcard players don't perform. In my opinion, the use of an early wildcard comes down to personal preference. If an FPL manager thinks that their team is performing below par and the use of a wildcard would help achieve higher gameweek points, they will be naturally inclined to use it. But for me, even though the temptation to change the structure of the team is truly daunting, I would recommend using the wildcard when there is a true reason to, i.e. you can justify the transfers for a significant amount of your squad, at least 5 players. Don't use the wildcard so early for the sake of it. If it ain't broke, don't fix it! Tips for the Sun's Dream Team Latecomers £30k league. Starting Gameweek 4, that's the weekend after international break. Right, to begin with, it's totally changed from last season. No unexpected Daley Blind "Star Man" every game, or Rooney randomly getting "Star Man" against Villa when he admitted he'd had a shocker. This season the ratings are done by whoscored.com. First tip, get to their site and see who were the top rated players from last season and who's done well at the start of this season. Look at who got the most Man of the Match awards and the top average rated overall players. For instance, you will be surprised to see that Man City's top rated player last season was Nicolás Otamendi. I'm not saying I will pick Otamendi but it's worth noting. That's a good indication of who you want. No point in having a player who doesn't get the right ratings. You get the basic 5 points for a clean sheet, 2 for an assist and 5 for a goal regardless of position (no extra points for a defender scoring). Also with the clean sheets it doesn't matter if your player plays 1 minute or 90 if he's on the pitch he'll get points as if he's played the full match. Likewise when Arsenal were 4-3 down to Liverpool and if they had brought on Kieron Gibbs for the last few seconds he would have scored -3 as it's minus a point for every goal conceded after the first. But it's the ratings of 7.0+ for additional 3 points and the whoscored.com Star Man gets an additional 5. There are no points for a player starting a game. Of course, you really want to aim for goals and assists. I always thought there wasn't much point in having a defensive midfielder, who doesn't score or assist but Moussa Dembélé despite only getting three goals and one assist was Spurs top rated player from last season with a higher rating than Harry Kane and Christian Eriksen. So I might rethink that but I would still go for goal scoring midfielders, i.e. Hazard, de Bruyne, Mahrez types. You also want clean sheets and top keepers who won't concede many. But a cheaper option from a mid table side who make a fair few saves can also work like Heurelho Gomes of Watford. He actually had a higher average rating than David de Gea over the season. You also have to remember that every game counts. So a Europa league tie against some part timers could be a points fest. Same with domestic cup games. Also this season you have three transfers per month so you can look ahead and if Manchester City play Hull, Burnley and Sunderland you can fill you boots and put in Sergio Aguero and Kevin De Bruyne. Whereas if Arsenal play Chelsea, Manchester United and Barcelona you might not want Mesut Ozil and Oliver Giroud plus if you can get two games a week out of someone then make the transfer. But you have to remember that game weeks start on a Monday so if you have Diego Costa and Chelsea play Monday night then he is locked out after that game until the following Monday. Any player who's team have played cannot be transferred even if they didn't play. Prices also rise and fall so if the cheap diamond you selected goes on a good run your mates will be paying more for him and you'll have benefited from picking him early. I'd also scan the player list for the under priced players and other players who will do well as someone else at the club is injured or the player priced cheaply at one club has moved to another. So Luke Shaw for example at £2.5m is a must have. I also think John Stones at £3m is under-priced. If Nolito carries on the point scoring form he's started the season on he'll be a must have at £3.5m. Finally, I would recommend scanning the fixtures and see who has extra non-league games. Follow Dream Team Expert on Twitter for more tips! Gray to Negredo was the most popular transfer leading up to the gameweek 2 deadline. 52k transferred Andre Gray out of their teams after he blanked in the first week at home to Swansea. Little did they know the Burnley striker would assist a goal and open his Premier League account v Liverpool in Saturday. This left the 10.5% who kept the faith in Gray rewarded while those who knee-jerked to transfer Alvaro Negredo in feared the worst going into Sunday's North East derby between Middlesbrough and Sunderland. A Negredo blank would be costly. Thankfully for the 18% of managers who own 'The Beast', he came up with two assists and scored the same amount of points as Gray due to his 2 bonus points. No doubt the two standout 6.5 strikers from the first two gameweeks will continue to cause headaches throughout the season. After spending £69.1m on new recruits so far, Liverpool have strengthened greatly this summer, particularly in midfield. While their notorious defensive issues are yet to be resolved, the question on most FPL players' lips after Liverpool ran out 4-3 winners at the Emirates was which of Liverpool's talented midfielders to sign for your FPL team. Coutinho was the favourite and raised 0.2 in value due to popular demand after his brace, Adam Lallana had a goal and an assist and Sadio Mane also impressed with his goal, though injured in mid-week and was ruled out of the game at Burnley. Add to that list Giorginio Wijnaldum, who weighed in with an assist and showed his quality at times last season, though seemingly forced to play a deeper role for Klopp than at Newcastle and Firmino, Liverpool's top point scoring player last season. The quality of these midfielders can be top class as we saw against Arsenal, but the consistency of all of these players hangs in doubt. Liverpool in general suffered with inconsistency last season. Beating Chelsea then then losing to Crystal Palace, losing 3-0 to Watford and then beating Leicester was the kind of form Klopp's team were in throughout last season, which could cost you points if they continue to blow hot and cold. Having been outstanding in attack against Arsenal, they struggled to break down Burnley's defence, so the early signs are that they haven't changed. Aguero and Ibra or bust? There is beginning to be a recurring theme in FPL this season. Ibrahimovic + Aguero = success. Like last week, they were the two highest scoring strikers again. The other premiums have not come close to the two most expensive players' identical record of 3 goals in two games and maximum bonus points from the first two gameweeks. Whether this trend continues remains to be seen, but the forward alternatives are sure to improve. After a slow start, it might be only a matter of time before Jamie Vardy and Harry Kane start hitting the net as regularly as last season, so it may not be best to panic to get Ibrahimovic for a -4 point hit or to wildcard in order to get both just yet, but another week like the last two and that might be a viable option as the pair have already gone up 0.1 in value and continue to increase in ownership. Miss out on another price rise and they could become difficult to afford even in a wildcard team. Gameweek 1 was an interesting start to the season. We saw some surprise packages that could be potentially good for our FPL team in the long run. Today I will highlight some of the best buys for Gameweek 2. First up, if you are looking for consistent returns from your defence, consider West Bromwich Albion players. With Tony Pulis style of play in which he likes to park the bus, West Brom’s defenders are value for money as they are pretty budgeted. Ben Foster scored a whopping 10 points in the first match of the season and showed why he is one of the best English goalkeepers around. If you are looking for a full back providing assist, at only £4.5m, Gareth McAuley provides good opportunity for assist while Craig Dawson offers goal scoring threats from set pieces at £5.0m. West Brom’s next few fixtures are relatively good, taking on Everton, Boro, Bournemouth, West Ham, Stoke and Sunderland in coming weeks. Next, Eden Hazard looks to continue his strong start of the season against Watford this weekend. Hazard has shown in previous seasons what he is capable of, apart from the 15/16 where injury made him have a pretty bad season. With Chelsea’s good run of fixtures in the next few game weeks, Antonio Conte’s side look to score big. Hazard is also able to play as a forward should his team mate Diego Costa ever get suspended for getting booked. At £10.0m, he is pricey, but the possible returns he can get you surpasses his price. Finally, Manchester United look to be title contenders this season after missing out for the past couple of seasons. With the addition of Zlatan Ibrahimovic, Paul Pogba and a few others, their squad look solid and with Jose Mourinho as their new manager, the club is moving in a new direction. If you are looking for a midfielder, Anthony Martial (£9.5m) is a good option as he provides lots of crosses into the box and is able to cut in from the left and create chances himself. For forwards, Zlatan Ibrahimovic looks to retain his goal scoring threat with his new team. He has shown he has what it takes to play in England despite his age. He is a premium player at £11.5m but I believe he is a safe long term investment that will bring you returns over the course of the season. Those are my picks for Gameweek 2. Most of them will be good in the long run. Some of them are budgeted, some are a premium, pick one that suits your needs for this weekend. In a rare gameweek where both Vardy and Kane failed to score, if you owned Zlatan and Kun and captained one of the two in the first gameweek then chances are you are in the top 200k overall. With budget midfielders on target and the only clean sheets coming from budget defences, gameweek 1 panned out in favour of teams with the most expensive attacking pair. The pre-season argument against owning both Zlatan and Kun is that the rest of the team suffers financially. However, 4.5 keeper Ben Foster was the highest scoring keeper and many 'Aguerovic' owners have him as the first choice in goal. Gareth McAuley, Jonas Olsson and Jonny Evans are all 4.5 and kept clean sheets. McAuley is owned by 10% and Evans is also popular at 8.6%. While these may be mere back up options for more balanced teams, an attack that costs over a quarter of your budget may mean some started one of the pair. Jordi Amat and Stephen Kingsley performed above their 4.0 price tag, although more likely to be bench fodder. Kingsley looks to be a stand-in for Neil Taylor, who was short on match fitness for the game at Burnley, but Amat could lay down a starting place at centre back now Williams has left. At 4.0 he will be good asset as a starting player in teams if he continues to play, as an enabler for the likes of Ibrahimovic, Aguero and Hazard. In midfield, 'Aguerovic' owners who sacrificed the cost of their midfield for their forward line would have been pleased with the point scoring of the lesser priced players. 8.0 Coutinho scored a brace at Arsenal to lead all midfielders. He comes in much lower than the premiums and could be the pick of the Liverpool mids, but is yet to reach more than 8 assists or goals in each of his 4 seasons at Liverpool, which raises concerns over his consistency and Liverpool's fixtures don't get easier until gameweek 6. The early bandwagons could be for the mid-priced midfielders who were in and out of form last season. Adam Lallana has a similarly unspectacular FPL record to his teammate Coutinho, failing to improve on 9 goals and 9 assists in 2013/14 at Liverpool, yet his goal at the Emirates will raise his ownership. Game time is touted as an issue for Lallana with so many attacking players at the club, so Eric Lamela could be the cut-price midfield answer at the same price. Lamela scored on the opening day and may have some managers believe this is the season he can deliver on a regular basis for Spurs on the back of a strong Copa America with Argentina, in which he scored twice and a pre-season in which he also bagged a couple and an assist. Lamela has failed to live up to expectations when he arrived from Roma in 2013, but looks in faster and stronger physical shape than he was when he arrived in England. Having ended last season in fine form, has he finally found his feet at Spurs or will we see yet more inconsistency? Xherdan Shaqiri disappointed in terms of goals and assists last season, but has already opened his account with a free kick against Middlebrough. He could be yet another past underachiever who has his breakout. A lot of people were talking about midfielders who might play out of position in a more advanced role in pre-season, meaning more of a goal threat. These players are Gerard Deulofeu, Bojan, Nathan Redmond, Firmino, Alexis Sanchez and Eden Hazard. Of these players, the standout in the first week was the cheapest, Southampton's 6.0 winger-turned-striker Nathan Redmond. His price-rise is predicted to be very high, as something of a differential going into the season at around 5% ownership. He had 4 shots inside the box, and only denied by good defending from Watford before finally finding the net. In the striker spot he could hit the ground running. Kyle Norbury, obsessive fantasy football manager and have been for many years. Bit of a nerd when it comes to stats. #TeamIbra. The above illustration is my Gameweek 1 team for the 2016/2017 Premier League season. With regret, after five consecutive seasons, this will be the final time I publish my team in advance on my blog. Doing so 36-48 hours on average in advance has become unmanageable. From now on I will aim to publish it 6-24 hours in advance (after the manager's press conferences) but on Twitter only. Rest assure, this is not the end of the blog. I simply prefer to publish my team on Twitter for convenience. Even if you don't have a Twitter account, you will be able to see it listed under my blog's external links - "Latest FPL Team". Content relating to FPL hints will still be available on this blog. The above team is very top heavy for a purpose. I intend to use the wildcard after Gameweek 3 during the international break. This will be a good time as teams would have settled by then and players would have recovered from their Euros/pre-season fatigue. I've had a go at predicting which team you should back in the first 20 weeks of the Premier League! So have a read about the perfect strategy to survive in Football Survivor! This is a big game, make no mistake, as both teams will be fighting for the drop this season. Bournemouth, having lost Matt Ritchie, will be looking to assert themselves as a Premier League side this season. Last year, they were fantastic at points, beating Manchester United at home and battling to stay alive. Striker, Wilson, was very unlucky with injuries last season and Bournemouth’s form slumped as a result, but with Eddie Howe in charge, and some decent summer acquisitions, you’d expect them to kick on. These are exactly the sort of games that the Cherries will have to win if they are to stay in the PL this season. Tony Pulis will be looking to kick on this season at the Hawthorns. His tenure as Baggies manager has been disappointing thus far, with many expecting him to inspire the club to the mid table of the Premier League. The almost certain loss of Saido Berahino ought to act as a catalyst for improved performance as the young Englishman has been flirting with a move away from the midlands for the last several seasons. Pulis will have a big job on his hands invigorating an ageing squad. But, the visitors in this particular clash ought to be dealt with. If Rondon is scoring goals and performing to the level that he can manage, than it ought to be an easy home win. The Champions will fancy this one. Leicester still look a real threat heading into the new season, even with the loss of N’Golo Kante and the rumours surrounding Riyad Mahrez’s future. In reality, Leicester have a stronger team than last year around, the signing of Musa looks a real bargain given his impressive cameo performances against both Barcelona and Manchester United in pre-season. Expect teams to face Leicester in a different way this season, no longer are they unpredictable. Ranieri’s men will stay behind the ball and counter attack as much as possible; but with the quality players that Leicester have at their disposal, knowing what they’re going to do and stopping them doing it are two very different things. This is what Football Survivor is all about, backing teams against the odds, when up against it and in desperate need of some points. Yet, don't rule Everton out of this clash against United. For the Red Devils, Goodison Park is never an easy place to go. Although running out convincing winners last time around, United under Fergusson had a very mixed record at the home of the Toffees. Mourinho and co will need to be at there very best to get a result here, in an atmosphere which is sure to be intimidating and vocal. Surely the’ve got to win at least one of their games? Here’s hoping that this is one of a few.. or even the only one? The KC Stadium will need to be at its very rocking best to inspire a result from the Tigers here. Yet, Palace might be the type of team that suits Hull. Lets not forget, there are some talented individuals still in Humberside; Hernandez, Snodgrass and Davies will all fancy themselves as Premier League quality players. Lets hope they can prove it in this fixture! This is a very even game, on paper. Stoke, as mentioned previously, have some fantastic players, as do Southampton, so we expect this to be a very tight affair. Stoke will press the Saints all over the park, and this might be why Southampton could knick it with a goal on the counter attack using their pace. Shane Long is a fantastic striker to have when running in behind and in the channels and up against a relatively physical and slower Stoke backline, he’ll fancy it. Claude Puel will need to win this type of away game if he wants to push his team into the higher places in the league. I’ve saved one of the big guns for late in the game… but now I’ve gotta back them in a clash of the titans. Pep Guardiola will look at these games as must win if City are to win another Premier League title. No doubt, Arsenal will go into this expecting a very tough game, certainly if Wenger doesn’t strengthen any further in the transfer market. City, on the other hand, should be well up for this given that they would’ve had the appropriate time frame to begin to adopt some of Pep’s ideas and philosophies. I would expect a close game here, but ultimately home advantage counting enough for the Citizens to grab a precious three points. The Hornets will need to be at their best to win this - but they ought to think that the atmosphere at Vicarage Road will get them through this. It seems that Watford have successfully managed to keep hold of Troy Deeney, which is huge for any chance of success. This is a repeat of the FA Cup Semi Final at Wembley last season, which Palace eventually won 2-1, so revenge will be on the cards for Watford. Expect Watford to sneak this one! You can’t really pick a winner here - but you’ve got to. Thats what Football Survivor is all about and thats why its such fun. In what could be an absolutely vital game at the bottom of the table; Sunderland need to go to Turf Moore and win. By this point, its anyones game really here. So its time to start praying and hoping that a Jermain Defoe inspired Sunderland can get those vital points they need! This is it… it all comes down to this. Alan Pardew and his little dance has gotta inspire Palace to a home win in order for you to survive… Can it be done? Hell yeah, Jason Puncheon rolls back those years for a late Palace winner which not only sends the Selhurst Park faithful into pandemonium but you into the promised land. You’re now officially in Football Survivor folklore as the greatest player ever… Or, Swansea spoil the party and you’ll forever be remembered by your mates as a Specialist in Failure. Join in and get involved with all the fun by joining Chief's Survivor League below! Chief's Survivor League is now ready to play! Which players have the highest ownership in FPL?